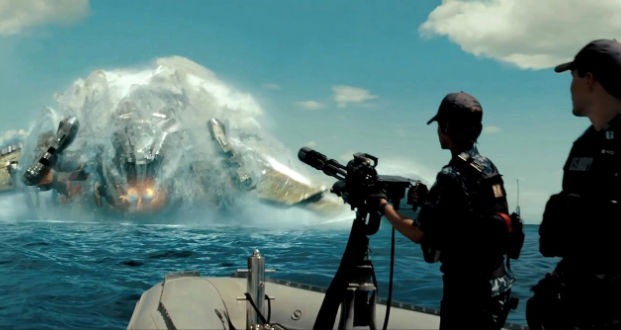 Battleship is Battle Los Angeles with character we can care about and a sense of humor. It takes the standard alien invasion flick and rejuvenates it by giving it a tenuous connection to a popular Hasbro board game and adding some twists of its own. Battleship centers around Stone Hopper (Taylor Kitsch), a guy whose potential is almost totally obscured by his ability to screw things up. After a brief prologue showing scientists sending a signal to a distant ‘Goldilocks planet’ – just the right size and distance from its sun to support potentially Earth-like life – the film begins with Stone and his brother Alex (Alexander Sarsgard) celebrating Stone’s birthday with beers and a cupcake. …is in charge of the PACRIM Exercises – an annual navy war game featuring the navies of fourteen navies and an athletic competition prelude during which, Stone has an unfortunate accident with a member (Tadanobu Asano) of the Japanese soccer team. While the war games begin, NASA tracks a formation of five ships heading toward Earth from deep space. One of the five ships hits a satellite and is destroyed, but the remainder splash down in the Pacific – almost on top of the war games. Imagine that! Three ships are within the field of a ginormous forcefield that the aliens whip up – big enough to take in the chunk of sea on which the Hopper brothers ship and two others – one American, one Japanese (captained by someone we’ve met earlier) and most of Oahu. When a scouting boat is sent to check out the alien craft, it sparks activity that prompts Alex, to fire a warning shot which, in turn, sparks an alien overreaction and the fun is underway. Peter Berg directs from a script by Erich Hoeber and Jon Hoeber and has put together an action epic that manages not to just regurgitate the stock clichés. Which is not to say that Battleship isn’t filled with them, just that they feel fresh because of things like the clever way in which the film references the original board game, or the way Jesse Plemmons takes a stock role – the sailor who talks too much when he’s nervous – and adds just a few quirks that make him feel like a real individual. Sarsgard is solid as Alex, the responsible Stone brother and Decker (the only good thing about Just Go With It) shows a few dramatic chops to go with her natural flair for comedy. Rookie Rihanna takes the role of weapons tech Cora ‘Weps’ Raikes – whose primary trait is her enthusiasm for her job – and goes for it full tilt. Neeson, of course, is there to add a little dignity and proper contrariness to the proceedings and is terrific with both sides of that equation. Real-life war hero Gregory D. Gadson, a double amputee, is unexpectedly moving as Sam’s newest physiotherapy patient, Lt.-Col. Mick Canales (Ret’d) – a man who has given up, but finds new purpose during the invasion. Asano’s Captain Yugi Nagata makes a good foil for Stone and the transition from foe to ally feels pretty natural – for all that it’s More than a bit forced. It’s Kitsch’s movie, though, and he brings it as the irresponsible, immature Hopper brother who finds himself having to step up. Stone is a much happier – and much more hair-triggered – character than Kitsch’s most recent previous work (John Carter) and he gives him just enough depth to keep us interested when he gets serious after being a bit of a likable idiot in the first act. The aliens are interesting because though they come from an Earth-like planet and have similarities to us, the differences are just enough to be creepy. Their weaponry is a mix of things we’ve seen before (deck guns that fire familiar-looking shells that have an order more destructive capacity) and fresh (a kind of metal ball with fiery spikes that shred stuff impressively). Although Battleship isn’t the most original film around, it’s an entertaining couple of hours – a popcorn flick that doesn’t pretend to be anything else. Previous PostDark Shadows – Just Seen It Movie ReviewNext PostDavid Shore On House’s Last Days!